The June Spirit - Can We Lip Sync This One? 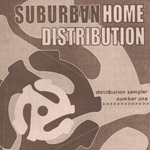 Distribution Sampler Number One: This release is a 23 track sampler CD included with the Suburban Home Distribution Spring 2002 Catalog/Zine. The Queers track is listed as "Do You Wanna Dance," but the song on the CD is "Sheena Is A Punk Rocker."